All new products are offered with at least a 12 months parts and labour guarantee. Some products are offered with 2 years or more parts warranties with some manufacturers, but may be subject to service/maintenance having taken place. Pre-owned and 2nd user products have 12 months or less, please check with the individual product. Products or Items installed and/or delivered by Capitol Mobility's staff and vehicles are covered by an 'on site' guarantee which means we or our appointed agent will go to where the item was delivered or installed to carry out guarantee works and/or bring the product back to workshops for repair and return without charge. For any other item or product the customer is responsible for the return and/or pick-up of it (including any costs or insurances involved) to and from our workshops where guarantee works will be effected without charge. Please see our terms and conditions of sale printed on the reverse of our headed paper for all other particulars. Items of a consumable nature will not normally be covered during the warranty period unless such items have suffered undue wear as a result of an original manufacturing defect. Such items as:- upholstery - seat belts - footplate and footwell coverings, this list is not exhaustive. Also punctures and accident damage howsoever caused are not covered by a guarantee. Fair wear and tear applies to all guarantees offered. Please note 2nd hand parts may be used in guarantee repairs or replacements to pre-owned or 2nd user products. Servicing charges start from £15.00 for a`Standard' service to a manual Wheelchair and from typically £55.00 on site for an electrically driven product (batteries tested for voltage drop only). 'Comprehensive' service, which is inclusive of all materials, all parts (see service agreement for any exceptions) and all labour during normal working hours is typically from around £145.00 per annum for a powered product. Please call for exact quotations. 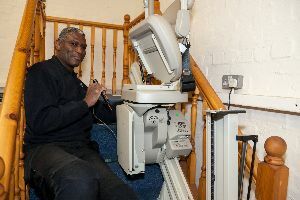 Emergency callouts and repairs are available to non-operational Stairlifts, Scooters, Electric Wheelchairs and the like. Most callouts are charged from £30.00 per hour for labour and travelling time. Out of Normal Working Hours (Monday to Friday - 9.00am to 5.00pm) from £60.00 per hour (from £30.00 per hour for Comprehensive service customers) as at 01/01/2012. 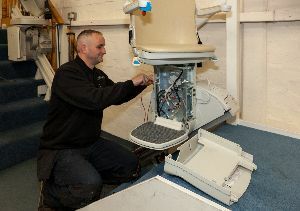 Other servicing charges are typically from £75.00 for a 'Standard' service, pick up and return from our workshops for Scooters etc., (includes full battery discharging and report) or 'Comprehensive' Stairlift maintenance typically from £155 per annum for Straight Stairlifts, inclusive of all materials, all parts (see service agreement for exceptions) and all labour during normal working hours. Capitol Mobility Limited will provide you with Insurance brochures which are regulated by the Financial services Authority (FSA). We strongly recommend 3rd party insurance cover for all Mobility Products. Please contact us or speak to our representative for more information.